CeBIT is one of the largest trade fairs for the IT Industry held each year, focusing on latest global IT trends and techniques. It is considered to be the most influential marketplace for buyers and sellers from over the world to gather to promote latest trends in the IT industry. This year, CeBIT focuses on Digitalization that is continuously transforming the world of business. The other major discussion trends at CeBIT 2016 are Big Data, Internet of Things, Social Business, Mobile and Security, Communication and Network. We are glad to invite you all at the Global Event CeBIT 2016 to meet our team to discuss about your service concerns and requirements in further details. Offering full spectrum of Remote Infrastructure Management service assuring peace of mind. Choose from a range of our managed IT service portfolio which are custom built for your business and can scale to your business needs. With our managed services, we can enhance your IT experience, and provide value to your business. Your technical support challenges will be handled competently and efficiently; allowing focusing your valuable time on managing your business. Our managed services ensure proactive monitoring, increased first time resolution and reduction in average response times. This in turn improves end user satisfaction, thus adding value to your IT. An ITIL aligned private label help desk solution in the cloud that seamlessly blends with your IT operations and is ready for immediate use without any upfront infrastructure investments. A Web-based hosted helpdesk with Private Label support that addresses critical IT and support areas like incident and problem management, SLA management, asset management, knowledge management and more. Either run the help desk to offer your end users a flexible, powerful and private label help desk platform or opt for outsourced Tech support to our experts working 24x7x365 with just one click for all support operations; while maintaining your company’s brand. Available round-the-clock; a dynamic and talented technical workforce – ensures your customers have the support that they need, any moment of the day or night. Hire our experts and Build your own dedicated support team to reduce costs and complexities of internal operations. Hire skilled and industry certified IT professionals at an on-going monthly fee and augment your current IT staff with our qualified IT experts. Planning to attend? Book your appointment now and reserve your Free CeBIT Ticket for the event. 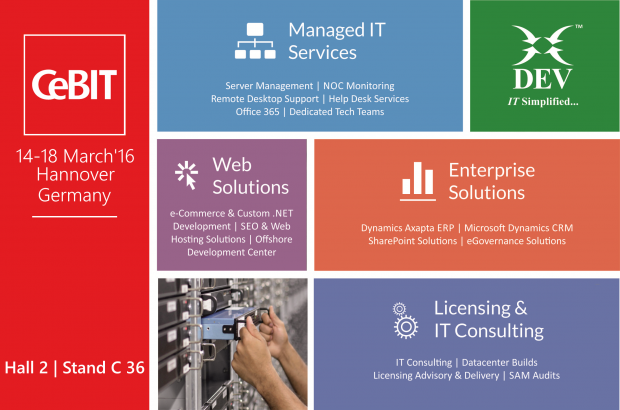 Visit http://www.devitpl.com/cebit-2016.aspx or email us at presales@devitpl.com to learn more. CeBIT 2016, a leading international IT event and exhibition at Hannover, Germany. FlightTime offers smooth and flexible charterflights from the airport next door to Hanover and back. Comfortable, easy and flexible.